ARE YOU CONSIDERING TO REMODEL YOUR HOUSE TO OBTAIN SOME EXTRA SPACE AT HOME? Don’t worry, it’s not necessary, our facilities allow you to store everything you don’t use regularly and thus you will get that extra space you need at home. 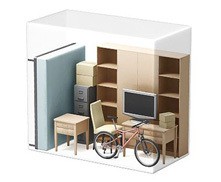 We offer a wide range of unit sizes so you will get a size that will be just right for you. If you sell your flat and need a space solution to store furniture until you get your new home, KUBICO SELF STORAGE offers a privileged location in Valencia and a skilled service that allows you leave your belongings and sleep peacefully. Our storage units can also be used when you do works at home, when you go on vacation or to store seasonal items such as garden furniture, windsurfing equipment, snowboards and any other sports equipment that requires so much more space as bicycles or golf carts.